Tonight when training at Itay's; the lights went out. Blackouts are fairly common in Israel. The emergency lights went on but it was still quite dark, so much so that I could only recognize friends by their body shape but not by their faces. Did this affect the workout? Of course not, the grappling class went on as usual, the kickboxing went on just the same, and so did the Krav Maga. No one even bothered commenting on the lack of light, besides we all know that Itay is not the complaint department, he is not big on listening to complaints or excuses. How well can you see when the lighting is poor? Can you see details? I worked with Itay on how to react when you can not tell if the gun is the right hand or the left hand, a situation quite possible on the street when the lighting is poor. Made me wonder; how many techniques depend upon perfect visual? What happens when you don't have the perfect lighting conditions in which you trained? What will you do then? In addition to being tired, alone and surprised, you will also have to deal with the darkness and the uncertainty of which hand the weapon is in. Are you training for this kind of situation? If the answer is yes, consider yourself fortunate. If the answer is no – you will have to reevaluate your entire training situation and goals. 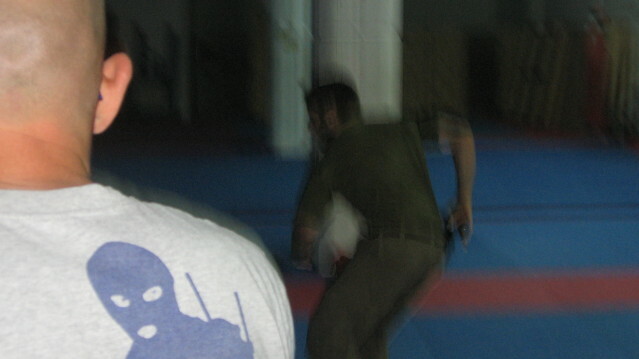 I just received a question about a technique that appeared in Black Belt magazine, it was an article about an American Krav Maga group. It involved a gun being pointed to the side of the hand (from behind) while the other arm was doing a headlock. The defensive move depended on the defender grabbing the gun in an exact fashion, this despite the fact that his face was in the opposite direction, he could not really see that gun that well, and he had to feel for the gun. Yet this was taught as a practical street technique. It makes me wonder. Imagine the above mentioned technique in the dark, how can you expect to grab the gun precisely as the guy in the photo shoot? In Krav Maga our goal is to survive, that is our first goal; that is our only goal.